Input text: the ground is clear. There is a very large [marble] cube. the cube is 10 feet above the ground. the cube is leaning 30 degrees to the front. a marble is 10 feet below the cube. a 6 foot tall [marble] sphere is 12 feet above and 7 feet to the left of the marble. 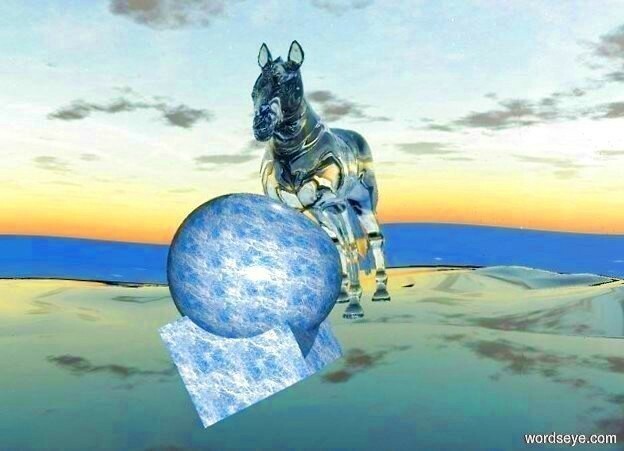 a large clear horse is to the left of the sphere. the sphere is in the cube. the horse is in the sphere. the horse is facing the marble.